Sneaking sips from his girlfriend’s alcoholic drink was a big no-no. And when Francisco Felix was warned to stay sober or leave the restaurant, he allegedly snapped. The 32-year-old went to his Lincoln Navigator to retrieve his loaded Smith & Wesson model M&P (with a barrel length of "less than 16-inches") to “flash” the disapproving restaurant manager until they tussled at the door and a round fired, according to police and court documents reviewed by Newsweek. On Monday, Felix was hit with a two-count federal indictment in Los Angeles federal court for weapons and methamphetamine charges. Felix’s attorney declined to comment when reached by Newsweek. Calls placed to reach relatives were not immediately returned by the time of publication. Felix and his girlfriend, referred to in the papers by the initials “E.V.” were dining at BJ’s Restaurant & Brewhouse in Victorville, California at around 1:15 a.m. on Dec. 29. It was nearing closing time and staffers had already locked shut the front doors. Felix was dining and tried to order an alcoholic beverage “without identification, but was denied by BJ’s employees,” the complaint states. The man then allegedly bolted from the dining room for the parking lot and returned to the front doors carrying something sheathed in a blanket, the complaint states. Felix then shoved the manager to the ground and drove off in his SUV, leaving his date behind. After more questioning, the documents show how E.V. confirmed Felix was her boyfriend of eight months and acknowledged seeing him storm out of the restaurant and then return brandishing a rifle from underneath the blanket at the front of the restaurant after his alcoholic beverage order was kiboshed. At 6 a.m. deputies, armed with a search warrant, staked out Felix’s Hesperia, California home on Balsam Avenue. The complaint suggests they spotted Felix remove from his Navigator a rifle case and place it into another car. Four hours later they performed an arrest and after searching Felix, approximately found 50 grams of methamphetamine “packaged in two separate baggies” in his left pant pocket and $110 from his left rear pocket, the complaint details. He allegedly acknowledged the “crystal… belonged to him,” the papers say. 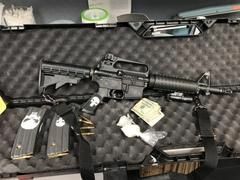 Investigators claim in the complaint that they found then located the black Smith & Wesson model M&P-15, .223 caliber rifle along with a pair of 30-round magazines “filled to capacity” and “with a round loaded into the chamber.” They also found 60 rounds of ammo. Victorville Police records show that Felix also possessed "other paraphernalia associated with the sales of drugs." When their feud turned physical, Felix allegedly couldn’t explain “who pulled the trigger sending a bullet into the ground,” according to the complaint. When he fled the premises and left his date to figure out her own way home, Felix claimed to have driven out to the Cajon Pass and into the valley to crash for a few hours in his car “to avoid being caught by law enforcement.” And the complaint notes that Felix claims to have taken out his fury against the rifle when he “threw it against the ground, damaging” the weapon he bought from a friend for $1,000. Weeks before the bust at his home over on the long December morning Felix was had a valet at San Manuel Casino in Highland, California park his white Nissan Maxima while he and E.V. enjoyed the night. The valet was spooked because he discovered a loaded black Glock, Model 34, 9mm pistol magnetically mounted underneath the car’s steering wheel, according to San Bernardino Sheriff’s Department report of the Dec. 5 incident recounted in the complaint. Felix was cuffed and authorities allegedly found 10 grams of “crystal” inside the Maxima’s center console next to a handheld taser and two mobile phones. They also found a red and blue “dash light kit” affixed to his windshield. When pressed, Felix blamed the light kit as honest tinkering. That he’d bought it online and “was just checking them out,” the complaint states. He also allegedly shifted blame to his cousin, claiming he “lent the vehicle” out earlier in the day and that his cousin “showed him the firearm.” He allegedly told the authorities that the “crystal” was his, but he claimed “he does not sell” and only used it for his own benefit. Felix, who had priors for transporting drugs in 2016 and possessing drugs in 2014 and 2015 (as well as a DUI in 2014) -- managed to post $50,000 bond for the casino meth and pistol bust. A trace on the Glock found that it belonged to a deputy with the Orange County Sheriff’s Department who reported it stolen back in Jan. 2017. According to the complaint, the weapon had been “taken from [the deputy’s] vehicle during a burglary” at his Westminster, California home. Before the case was taken over by a Special Agent with the Bureau of Alcohol, Tobacco, Firearms and Explosives (ATF), Felix was hit with a stack of state felonies including assault with a firearm, possession of the firearm and ammunition as well as carrying a controlled substance while armed with the short-barrel rifle, which, if true, would be subject to regulations under the National Firearm Act. Felix’s trial is set to begin on Aug. 20, a U.S. District Court for the Central District of California spokesman confirmed in a release. If convicted, Felix could serve up to 50 years in federal prison.